Seems I have spent a great deal of time reading during my knee replacement recovery, and a lot of it rather unsatisfactory. 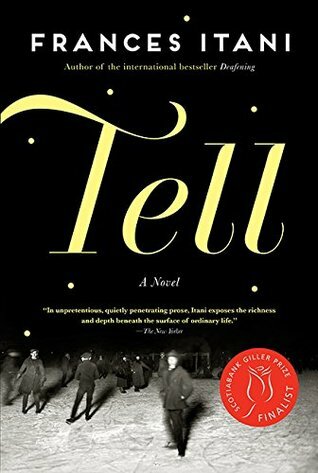 So, guess what, here comes another downer review from me, this time for Frances Itani’s Giller Finalist, Tell. I know, I know, another Giller novel. And we already know my antipathy for Gillers, which leads one to ask: Lorina, why do you keep doing this? I suppose I keep delving into Giller novels because I’m trying to figure out what I’m missing. And guess what? I still don’t know, because Itani’s waffling novel did nothing to address that quest. Set after WWI in Deseronto, Ontario, the novel at first appears to be one which deals with Kenan, a severely wounded veteran (loss of one ear, eye and arm), who returns and attempts to pick up the shattered remains of his life, with a wife and a community who dearly love and admire him. It has all the hallmarks of a rich tale about PTSD. However, about half way through the novel Itani apparently changes her mind, and instead focuses on the dissolving marriage of Kenan’s aunt and uncle, and the aunt’s affair with the new choirmaster. When I compare this post WWI novel to Joseph Boyden’s shattering masterpiece, A Long Journey Home, I can find no reason whatever for the accolades accorded to Itani’s work. Itani meanders and whines. Boyden skillfully and slowly rips your heart out. Should you read it? Sure you should. Will you enjoy it? Damned if I know.